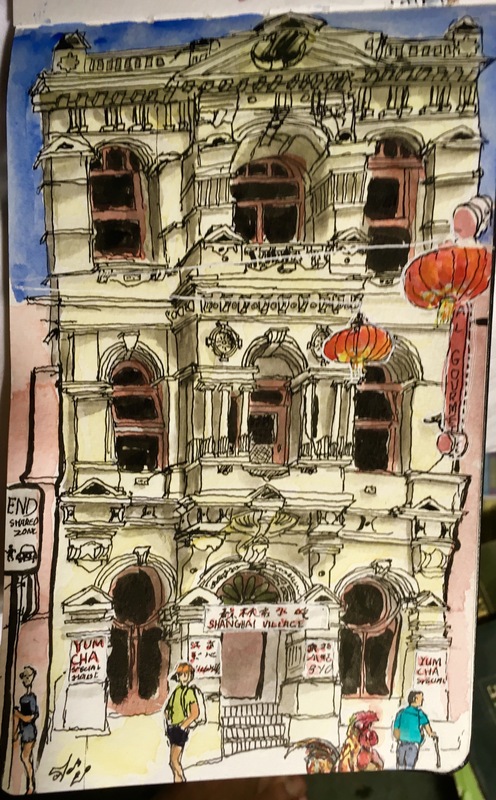 Sketching an old building that I admired in 1983 when I worked around the corner, made me look further into its history. 112 Little Burke st in Chinatown looks a little unloved now, but holds a lot of history around it. Now the dumpling village the building was completed February 8 1887. Designed by the architect DeLacy Evans who designed Melbournes Parliament House! It’s called the Sum Kum Lee building and was built for Lowe Kong Meng who at the time was a wealthy businessman, ship owner and philanthropist. I don’t know why Lowe Kong Meng named his buildings Sum Kum Lee… but he had the £ to have the best known architect design his second building for his wife that he married in Tasmania, (he got around), Mary Anne Prussia. The SKL building was “first class” with thought regarding shade and lighting. ” a beautiful building in an unfortunate location” one newspaper said. It is supposed be a western interpretation of Chinese style. It took me a lot to see the Chinese influence…..
Before SKL building was completed Lowe Kong Meng was already influential, and was co author of a pamphlet regardng “The Chinese Question in Australia “. Upon reading today I can see ripples of the present!